The 2019 Ram 1500 has a new mild hybrid system, a glorious optional 12-inch touchscreen display, and storage cubbies all over the interior. But that interior is also hiding some neat design easter eggs that call back to classic truck stuff. Ram parent company Fiat Chrysler is really into putting semi-secret styling elements into its vehicles. The Jeep Renegade is positively bristling with aesthetic callbacks to company heritage, and even the new Wrangler has a handful of subtle ones. 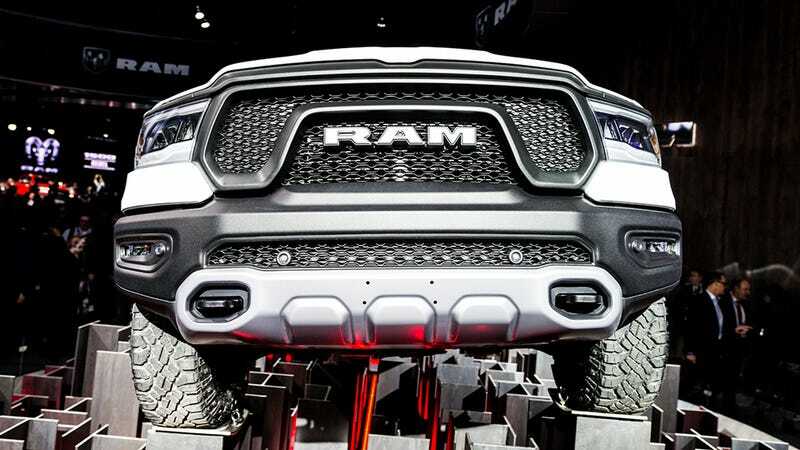 Here are the coolest decorative features I found on the new Ram half-ton truck. In the bottom of the cavernous center console, there’s a little parade of Ram trucks through the generations etched into the plastic. You’ve got the OG Ram that was around through most of the 1980s, the second gen that ran through the ’90s, then the ’00s one and the fourth gen that’s being replaced by the 2019 truck. That piece they’re on flips up to make a divider for whatever you’ve got stashed in there. The console is incredibly versatile and deep. Note also the useful “Max Fill” line, which will let you know if your stuff will keep the lid from closing. That “Max Fill” line exists because the lid itself has a storage compartment in it. And on the underside of that compartment’s lid is this little study guide for geometry class. You’re probably not going to be referencing the protractor and conversion table when you’ve got a smartphone and a giant infotainment screen to do things like math for you, but it’s neat as a design element. Another reference ruler is embedded in the plastic near the rear passenger footwell, for like, measuring your feet I guess. Or maybe the fish you just caught and are about to toss in a cooler. Got to stay above the legal limit, after all. If you look close, you’ll see that there’s a cute piece of retro technology placed right below all the controls in the Ram’s main console, reminding you of a simpler time when cowboys roamed and records stores still existed. The giant, glorious infotainment screen might be the new 2019 Ram’s coolest and most useful feature, but it’s more fun to find hidden treasures around the truck’s interior. I wasn’t able to open the hood or crawl into the bed, so future owners might find more interesting elements when they start taking delivery. If you get to peep the truck for yourself soon, let us know if you find anything else. Remember the Ramcharger? It was Dodge’s two-door SUV in the style of a Chevy Blazer or Ford Bronco. Lone Wolf McQuade drove one, of course. And now it’s a phone rack. Neat.